After digging around a little bit, I discovered that for me the problem was in my Wi-Fi connection and I also cleared the app data and cache of Google Play Store. That fixed the error on my end. 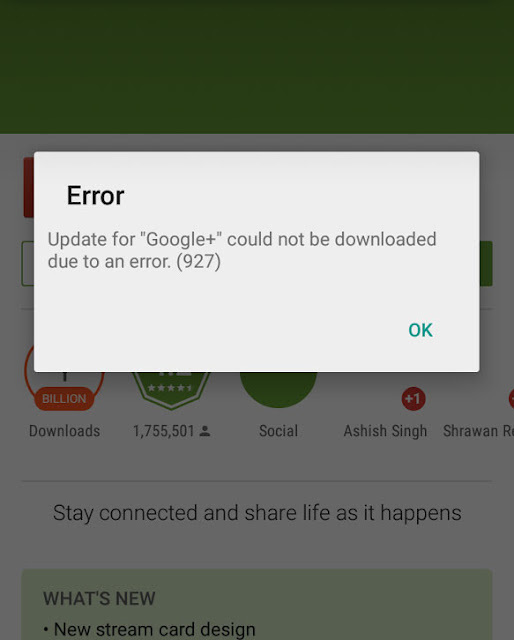 So, I wanted to put this post up to help other people going through the same Error 927 while downloading or upgrading phone’s applications. Under Device heading, locate and tap on Apps. Slide your screen to reach the All apps section or list. Scroll down and find Google Play Store and tap on it. Click on Force Stop, Clear Cache, and Clear Data. Go to Android’s main Settings. Under Personal, click on Accounts. From the Options Menu click on Remove account. From the same place, add back your Google Account. When your account is removed, you can try clearing cache for the same apps mentioned in Method 1 i.e. Google Play Store and Google Services Framework. Besides clearing cache/data, force stopping and re-adding your Google account, the only thing that you can do is try different Wi-Fi networks. If nothing helps, there’s always factory reset after a proper backup.